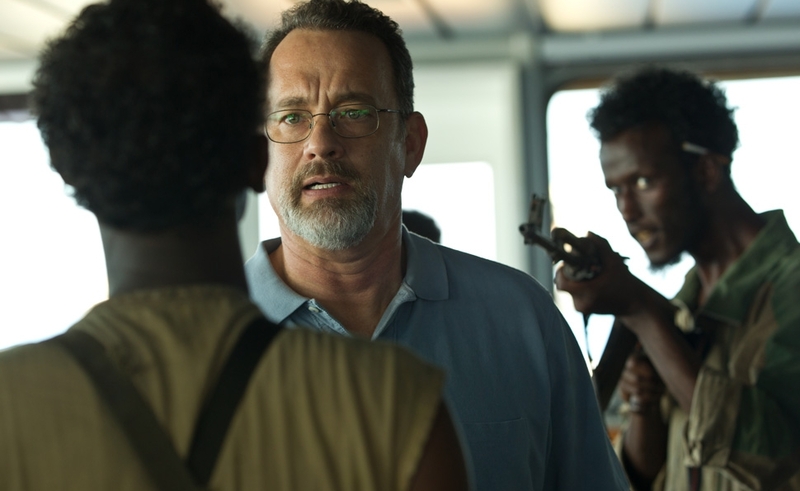 Though Captain Phillips’ title is simple and to the point, it’s also a bit deceptive. The film recounts a 2009 incident that found American merchant-marine captain Richard Phillips held hostage by Somali pirates after his ship, the Maersk Alabama, was hijacked, but it’s really the story of two captains. One is Phillips, (Tom Hanks), a committed professional and family man. The other is Muse (Barkhad Abdi), a young veteran of enough successful raids that he’s impressed the warlords who control his region of Somalia, and earned a position of authority. One commands a mammoth cargo ship; the other, a skiff fit for a four-man crew. One’s a stickler for procedure and for taking every possible precaution, the other’s a reckless improviser. Yet for all that divides them, the opening sequences of Captain Phillips keep drawing parallels between the two. And once they meet, the two captains start seeing the parallels, too, though neither talks about them. Making that kind of connection would only disrupt the game of wills they end up playing. Captain Phillips has one job it needs to do well: provide a convincing recreation of a dramatic event. It overachieves in almost every way imaginable. Director Paul Greengrass couples the handheld, immersive, you-are-there approach he brought to United 93 to a story that also lets him draw on the influential approach to action found in his Bourne series entries. The result is a relentless, gripping film—even by the high standards of a season filled with them, and even though there’s little suspense about the outcome. Greengrass generates tension in virtually every moment, from the slow buildup to the Maersk Alabama’s boarding to the finale, which ends the standoff without offering much sense of relief. The story ends, but the conditions that allowed it to happen persist. That’s another key to what makes Captain Phillips so effective. Working from a script by Billy Ray, Greengrass introduces Muse as he recruits a crew for his pirating venture. The sequence establishes him as more of a pitiless middle manager than an outlaw buccaneer. He has to answer to gun-toting, SUV-driving men with an insatiable demand for money, and he needs to choose shipmates from the ranks of men who have virtually nothing, and will promise what little they have to secure a place. He ends up with a crew of men who vary wildly in experience—and, as he later discovers, in their willingness to obey his orders. The film never demands viewers see Muse as anything but a bad guy, but it also gives him tremendous dimension, depicting the world from which he comes and the circumstances that drive him. Right or wrong, he sees piracy as a way out, but not an easy one. He’s embarked on a demanding job and feels the need to see it through. So has Phillips, and that’s where the parallels kick in. Respected but not loved by his men, Phillips demands professionalism and drills his crew for safety. When Muse and his men take over the ship, Phillips steps to the fore and throws himself into managing the situation, first by helping the sailors hide and providing them with coded prompts to sabotage their enemies, then by making himself a lighting rod for the pirates’ attention, a choice which makes him a hostage, held for a multi-million-dollar ransom. Phillips begins the film fretting privately to his wife (Catherine Keener, who has just one scene), then runs the ship with the stern devotion to process that, the film suggests, has defined his career. When the pirates board, he masks his wiles with Yankee conviviality, accommodating his unwanted guests while simultaneously working to subvert them. Then, when circumstances worsen, he does his best to keep his dignity and wits as his hopes for survival dim. It’s a remarkable performance, one of the best of Hanks’ career, but it wouldn’t work without his able foil, Abdi, an untested actor born in Mogadishu and recruited from a large Somali immigrant community in Minneapolis. (Barkhad Abdirahman, Faysal Ahmed, and Mahat M. Ali, the actors playing his crew, come from the same community and knew each other before filming began.) Abdi brings an assurance to the role that harmonizes beautifully with Hanks’ own confidence, and without putting too fine a point on the similarities, Greengrass repeatedly shows that both are men trying to keep an impossible situation from slipping even further out of their control, then digging deep for the strength to carry on when it does. That drama, as much as the flawlessly executed action sequences, is what makes the film work. Hanks and Abdi play out the larger clashes around them on an intimate scale. And while they come to understand one another better, there’s nothing in that understanding that suggests their worlds will ever reach an accord. Phillips discovers just how few choices Muse has had in his life, and how the ones he made brought him to this situation. Muse discovers that the plentitude of America is made possible in part by an abundance of military power. Their encounter ends, but their worlds will clash again. Captain Phillips could have stopped at simply depicting what happened; it’s the steps it takes to examining why it happened that make it extraordinary.